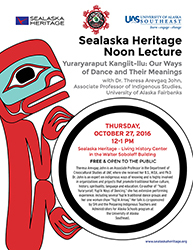 Sealaska Heritage Institute (SHI) will sponsor a lecture by a professor from University of Alaska Fairbanks on Yup’ik ways of dancing. "I believe that we are all lifelong learners. It is very important to share our wisdom and knowledge with others. We can live in the world of peace and harmony,” Dr. John said. Her work has been presented at professorial conferences on the local, national and international level. Dr. John currently serves on the National Advisory Council on Indian Education and the International Indigenous Women’s Forum. She is a former member of the Alaska State Council on the Arts and the former Chair of the Traditional Native Arts Panel. She is also the recipient of the Governor's Distinguished Humanities Educator Award and Alaska State Library Award. The free lecture is scheduled at noon on Thursday, Oct. 27, in the Living History Center at the Walter Soboleff Building in Juneau. Her talk is co-sponsored by SHI and the Preparing Indigenous Teachers and Administrators for Alaska Schools (PITAAS) program at the University of Alaska Southeast.